Streak-Free Window Cleaner…No Wiping or Squeegeeing Required! So I decided to make up a big bottle of this simple cleaning solution I found on Margaret’s Cleaning website. Since we just got finished having tile installed in our kitchen and EVERYTHING is covered in dust and filth…this big bottle is going to come in handy! Margaret uses this glass cleaner in her cleaning service to save money and to remove greasy fingerprints. After giving it a try I’m now a believer too! a gallon jug (I used one of my favorite re-purposing containers…a Minute Maid OJ jug). Fill the empty gallon jug 1/2 full of water. Add the above ingredients in the order listed. Be sure to add the Dawn dish soap last so it doesn’t lather too much when pouring in the other ingredients. Fill the jug the rest of the way with water. Gently shake jug to thoroughly mix ingredients, then pour some into a spray bottle. I tried this cleaner out on the mirror in our studio bathroom and it made short work of the grease and grime. It really wasn’t even a challenge for this cleaner formula. It easily cut through the grease and grime and made the mirror shine in no time flat! If you’re looking for an all natural glass cleaning formula…Margaret’s got that too! And the beauty of this formulation is its effectiveness at removing stubborn water spots from glass doors….such as the shower or patio doors! Simply mix equal amounts of white vinegar with water. If you have stubborn water spots….spray on, leave on a few minutes, and wipe with a white paper towel (or you can use newspaper.) The vinegar will “eat away” the hard water deposits. This does not dry as quickly as the first glass cleaner, because there is no rubbing alcohol, so you will probably have to wipe longer to make sure there are no streaks. What is your favorite glass cleaner? DIY Floral Candle – The Perfect Handmade Gift Idea! Forgot to mention it also works awesome on stainless steel appliances! The effectiveness and versatility of this cleaner combined with its antiseptic germ-killing qualities make it invaluable! and you save so much $$$ making it yourself! Thanks for recipe….Im always looking for ways to clean better. My Mom told me about the vinager and water cleaning method, and I dry with torn balled up newspaper. THE BEST …. And, hmmm, how much did that cost me? PS Sometimes I just pour yhe. Mix of half vin half water in a big bowl, and dip balled newspaper in and wash windows with that. Esp if they are dirty, ie patio doors. Then buff with clean newspaper. If you don’t get the newspaper delivered, make friends with your neighbor! Vinager works wonders on lots of things? Google it! I have many Ball jars like the one shown. Would love to get the sprayer that appears in the photo. Where can I find it? This happened to us and it was a professional window cleaning company that made the error. There’s no going back once that coating is damaged. Just a quick reminder–do not spray glass cleaner directly onto bathroom mirrors that have a metal lip at the bottom. The cleaner will seep under the lip and pool behind the glass, and eventually damage the silver backing–and it’s permanent. You’ve probably seen old mirrors that have that black “bloom” around the edges. Spray your cloth and then wipe the glass, being careful not to let the cleaner get under the edge. After using homemade glass cleaner, you’ll hate the expensive “blue spray” we all grew up with. 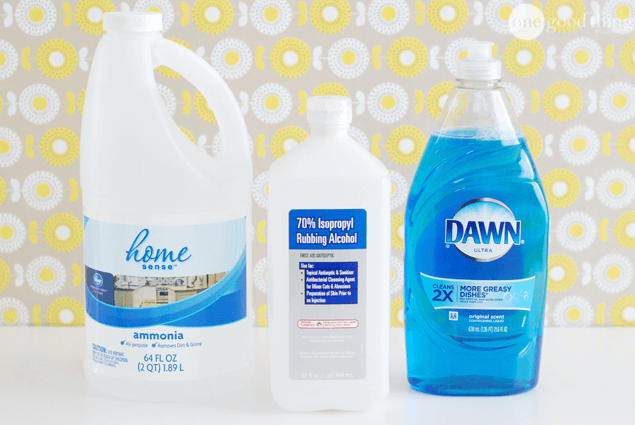 It sure doesn’t hold a candle to cheap, effective homemade cleaner! Aaah good old vinegar. I love this trick thank you. I wrote a blog post recently here: http://yumhacks.com/10-simple-tricks-will-keep-your-kitchen-spotless/ where I mentioned your technique for cleaning cabinets. I am going to have to add this technique and increase the size of the listicle. :) It is crazy how many things you can do with vinegar and baking soda huh? Last week, my husband and I moved into an apartment where the glass windows were not only dirty, but cracked. We had the cracks repaired and I have been desperately trying to get all of the windows cleaned. I really like the idea of using white vinegar as a natural cleaner, especially since it will eat away hard water. However, do you think that vinegar will eat away the grime as much as a regular store bought cleaner? Love this and love the smell (weird)!